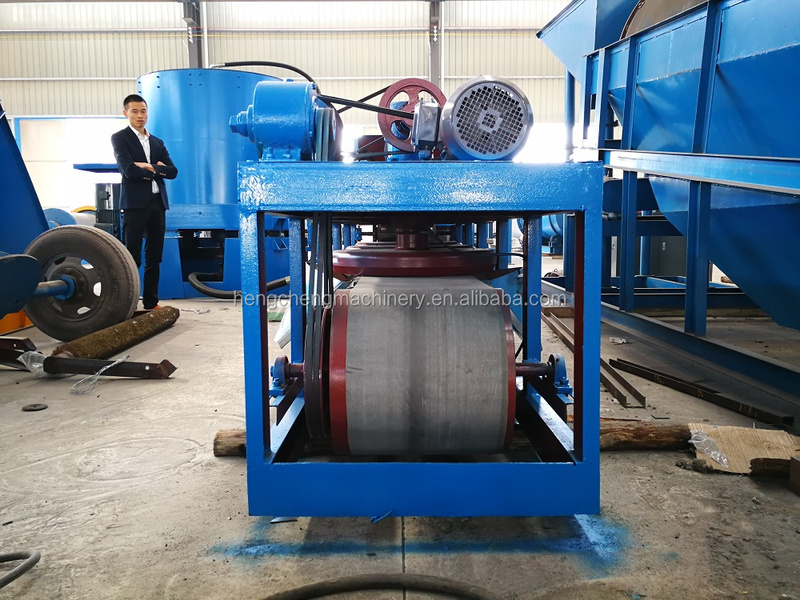 ﻿ 3 disc electromagnetic separator dry for tin titanium|Jiangxi Hengcheng Mining Equipment Co., Ltd.
3-disk dry electro-magnetic separator is widely used in ilmenite, monazite,tungsten, tin, tantalum, iron ore and other minerals with magnetic and non-magnetic dry sorting. This machine is sorting mineral size less than 2-3mm of weakly magnetic minerals and rare metal ore selection ,it is a very important mineral processing equipment. according to the difference of magnetic minerals, can achieving efficient separation of minerals can form different intensity magnetic disk by adjusting the excitation current levels, can also be adjusted each evel disk and sensing distance between dressing grain is to get different magnetic induction intensity,reaching a one-timeseparation of various minerals. 1. All the goods will be delivered in 10-20 days after receving payment. 2. The machine will be packed in export container. 3. Motors and small parts will be packed in new strong wooden cases that suitable for long distance ocean transportation. 4. We promise that your goods will be shipped to destination timely and safely. Below items are the China best sales for mineral separation , CLICK ⇓ !!! All machineries from Jiangxi Hengcheng Mining Equipment Company are made by ourselves, with lower price, good quality and assured full after service. The quality guarantee is 12 months after finishing the trial run of machines which has been shipped to the buyer side. If any part (excluding easily damaging parts) is found defective in quality within warranty period, we would like to replace it for free. After warranty, spare parts can be replaced based on favorable price. We provide you with the prophase plan, process flow design and manufacture equipment according to your special demand. We always keep certain inventory level of spare parts, which means the replacements can be shipped to you right away. 3. We’d like to recommend a suitable model for you and send you a best quotation. So please give us some more information about your requirement in your enquiry. What is the type and size of raw material? What is required size of final product(mm)? What is the capacity do you need per hour? Hengcheng company is dedicated to provide a complete line of equipment including shaking table, spiral chute, jig machine,trommel,rotary scrubber, flotation machine, magnetic separator,grinding mill, and so on. We are involved in the range of mineral beneficiation services including mineral testing, process flowchart design, installation and commissioning, technical consulting, as well as staff training,etc. Our proven technologies and experience permit us to provide every customer with the most effiicent & commercial beneficiation plant equipment.